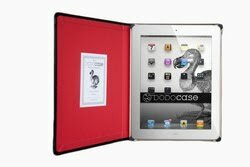 DODOcase Debuts iPad 2 Case, Available in the Signature Classic Style and Special Limited Edition - DODOcase Continues to Preserve the Art of Bookbinding By Updating Design for the iPad 2, and Pledges 10% of Initial Sales to Company Relevant Non-Profits. DODOcase announced today that their hotly anticipated iPad 2 cases are now available for purchase. The DODOcase for the iPad 2 comes in the classic DODOcase style, with a choice of eight color-linings, as well a special limited edition DODOcase commemorating the launch of the iPad 2, along with DODOcase’s one-year anniversary. DODOcase quickly rose to popularity following their launch alongside the iPad in April 2010. Overwhelming community response led to notable critical acclaim from such varied publications as GQ, Vogue, and Vanity Fair, and was eventually awarded MacWorld’s 2010 case of the year. Handmade by local artisans in San Francisco using traditional bookbinding techniques, every DODOcase has its own unique character. The DODOcase team is thrilled to have given new life to the art of traditional bookbinding by adapting it to the world of e-readers. In keeping with the company’s founding philosophy, DODOcase is offering individuals the opportunity to donate 10% of their iPad 2 case purchase. At the buyer’s choice, and between March 9, 2011 and March 14, 2011, 10% of sales will be donated to SFMADE, San Francisco Center for the Book (SFCB), or Leukemia & Lymphoma Society, three DODOcase relevant non-profits.